Pictured on the right is a 2 foot tall dwarf ambarella tree with fruit. It was mail ordered as a very small plant, and was planted about 1.5 years before this picture was taken. It is growing in full sun. This ambarella takes the Phoenix heat very well, except for a little bit of sunburn on its trunk, and it grows continuously during warm weather. I protect it with frost cloth draped over a pvc structure on the coldest winter nights as a precaution. It lost all of its leaves during the winter, except for some tiny shoots near its branch tips, and didn't really start growing again until April. This tree flowered during the fall and held its fruit all winter, which looked unusual since it did not have leaves then. The fruit are still not ripe and the ones most exposed to the sun have gone bad, but the more sheltered fruits appear to be in good condition. I was inspired to grow ambarella after eating the fruit from a tree in Hawaii, where they are called vi apples. They were delicious. 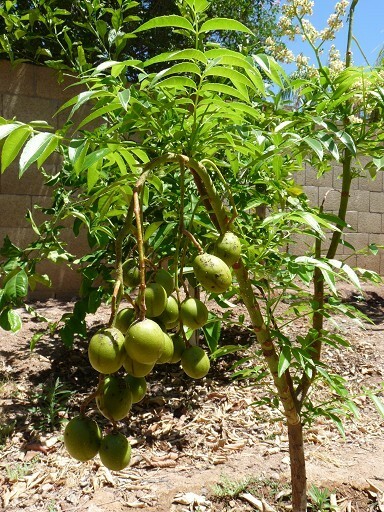 Ambarellas are very easy to grow in Phoenix as long as they get sufficient water. They would be an ideal fruit tree for here if they were not frost sensitive. They produce large quantities of fruit and grow rapidly. During winter they go semi-dormant. Full size ambarella trees are very large, but dwarf varieties which reach 6 to 10 feet are available through mail order. Dwarf ambarellas also make suitable potted plants. Ambarellas thrive on the summer heat. They do get sunburn on their trunks when they are young and their canopies are small. Use a latex paint, diluted 50% with water, to paint the trunks so they do not scald. Ambarellas are frost sensitive, being hardy to 29 F., and should be protected when temperatures might go below freezing. Covering the tree with frost cloth several nights a year is usually all that is needed. Dig a hole at least twice the size of the rootball. At a minimum, make the hole 2 feet in diameter and 2 feet deep. Back fill the whole with the same native soil that was removed. It also is a good idea to finish with the hole an inch or two recessed so that a watering basin is formed. After planting, spread a thin layer of compost on top of the soil to help conserve moisture and to supply some nutrients. Do not fertilize the newly planted tree until it has been vigorously growing for a couple of months. Ambarellas do well on a grass watering schedule. Ambarellas grow steadily with little to no fertilizer. Growth can be further encouraged with light applications of fish emulsion 5-1-1. Ambarellas are often grown from seed and there are no named cultivars. If the characteristics of a parent plant are desired trees can be propagated through hard wood cuttings. Aphids hassle the new shoots when the ambarella is emerging from dormancy. One might want to poison them when the tree is small to help it out. Once the tree is larger and more vigorous this shouldn't be necessary.